East Texas Christmas Day trips. Considering the state of the world, that made sense. So, for my Henderson friend and others who plan to stay home this year, here is a list of places to spend the holidays in East Texas. First, there are three Bethlehems in the East (Texas, that is). They�re in southeast Upshur County, near Gilmer; in Milam County, near Rockdale; and in Angelina County, west of Lufkin. All three usually have Christmas-centered church services. In Palestine, the stains fall mainly on the panes. A few hours spent touring the churches of downtown Palestine will reward you with a view of some of the most beautiful stained glass windows in East Texas. Many date back to the l850s. For a map, contact the local chamber of commerce. 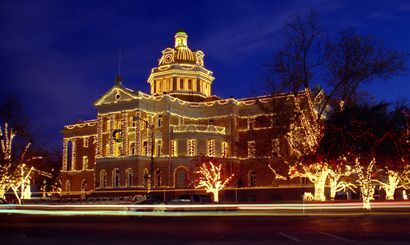 You can light up your life at Marshall where the downtown area is ablaze with a a lighting spectacular that includes 3,000 miles of string lighting, 2.5 million bulbs, and 8,000 manhours of volunteer work. It is the nation�s largest concentrated Christmas lighting display. Another Christmas lighting display is in Tyler, where the Municipal Rose Garden comes alive each December with a Winter Lights Festival. Visitors can stroll through a series of larger-than-life illuminated sculptures of holiday figures and a 14-acre garden of lights. If you�re into fruitcakes, visit Eilenberger's Bakery, also in Palestine. When German immigrant F.H. Eilenberger came to town in 1898, he brought with him an old country fruitcake recipe still used today by his descendants. 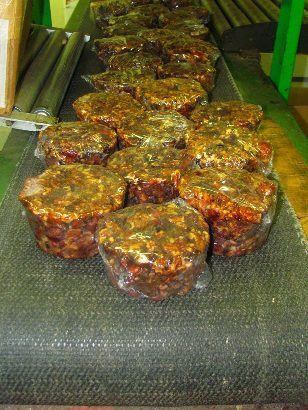 Many swear that it�s the best fruitcake in East Texas. To walk off those holiday pounds, take a walk on the mild side by exploring the Rusk Footbridge, reportedly the country's longest such bridge at 546 feet. The original structure was built in the l850s across a creek dividing a residential area and downtown Rusk. The bridge was rebuilt in the 1960s. If you would like to confront the ghosts of Christmases past, few graveyards can match the beauty of Scottsville Cemetery, a small family cemetery near Marshall. Founded in the 1840s by Colonel William T. Scott, the cemetery contains a priceless collection of Italian marble statuary standing over the graves of six generations of the Scott and Rose families. If you're into road trips, take a drive down East Texas' oldest highway. The King's Highway (Texas 21) stretches from Toledo Bend Reservoir near Milam to San Antonio. It is also one of our most scenic roadways. The route was used by Indians and traveled by Spanish missionaries in 1791. It is also known as El Camino Real, the Old Spanish Trail, and the Old San Antonio Road. At Sulphur Springs, you�ll find music for the season -- right out of the box. The Leo St. Clair Music Box Gallery, located on the second floor of the City Library, contains one of the largest and most diverse collections of music boxes in the country, some 300 different boxes in all. And, finally, don�t overlook the floating Christmas parade of Uncertain. Each December, usually on the third Sunday, the town�s residents stage a floating parade on Caddo Lake. The town got its name from riverboat captains who had difficulty finding the landing.